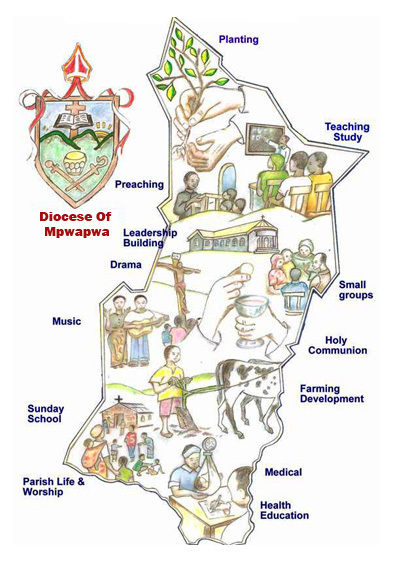 The Diocese of Mpwapwa was inaugurated on 23rd June, 1991. It was formerly part of the Diocese of Central Tanganyika. The Diocese is part of Anglican Church of Tanzania (ACT) and a member of Christian Council of Tanzania (CCT). The Diocese takes in the administrative districts of Mpwapwa and Kongwa, both just East of Dodoma, the nation’s capital and about 400 km from Tanzania’s main port and city, Dar Es Salaam. The Diocese is led by the Bishop, Diocesan Council (appointed by Synod), Diocesan Secretary and other 4 Heads of Departments. There are about 140 clergy working in 115 parishes with about 530 congregations and about 200,000 parishioners. The Diocesan Motto is in Kiswahili “Kumtazama Yesu” which means Looking Unto Jesus and speaks of the need to keep our eyes firmly set on Him especially when the road is rough and steep. Our Vision is “Presenting every one complete in Christ” (Col 1:28). We have a very special link with the Diocese of Rochester (England). We thank God for them, and others, who had been partnering with us in mission in many different ways. We trust you will enjoy learning of the work of the diocese through this website and look forward to saying “karibu sana” (welcome) when you chose to visit us.